Bionic Briana: Rest in peace, Mr. Goose. Rest in peace, Mr. Goose. 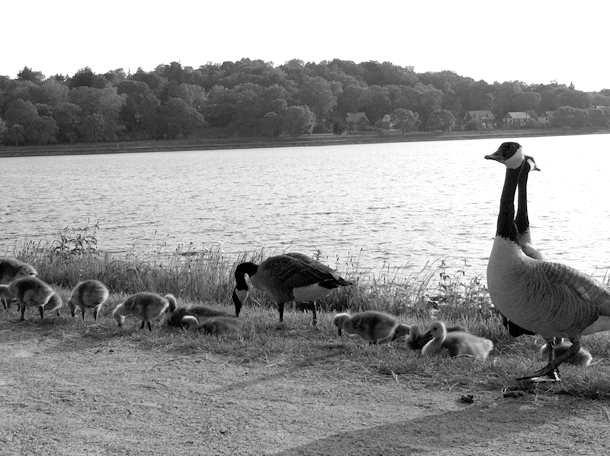 Canada Geese, Chestnut Hill Reservoir, Boston. June 2011. A few weeks ago, our local zoo opened a new exhibit called the African Savannah, which, as you can imagine, contains animals native to Africa. At this time, though, the exhibit is partially open and the only animals currently on display are two male lions. So today I figured I'd brave the new-exhibit crowds and take Alice to see them! Just a warning: This story does not have a happy ending. We got to the zoo shortly after it opened, and because the weather is warm and the skies are blue, the place was already packed with kids and moms and strollers. We met up with two other moms and then made our way through the crowd to see the new enclosure for the lions. As is usually the case with zoo animals, the lions were lazily sleeping on rocks and were barely visible from where we were standing. Fortunately there is a beautiful sculpture of a lion family near the exhibit that was way more interesting for Alice and her friends and they happily climbed and explored while us moms chatted. And then, as we were standing there, two geese tried to fly out of the lion enclosure. And only one of them made it over the 40-plus foot fence. After the initial scare and shock wore off of an animal hitting the fence directly in front of where we were standing, I then said to my friend, "That goose better get out of there quick!" Surprisingly, the lions didn't notice the honking of the geese or the chaos of the crash-landing and continued sleeping about 25 feet away. That is, until the goose tried and then failed to fly out a second time. As soon as the goose squawked and hit the ground, I saw the lion's head pop up and then, at the speed of light, he bounded across the enclosure, body low to the ground and pounced on the goose. Right in front of us. There were gasps and shrieks and yells as the lion picked up the goose and carried it a few feet away, directly in front of the viewing window where a crowd of people stood. And then the other lion came over to get in on the action. I'll let you use your imagination of how things ended for the goose. As traumatizing as it was to watch and as terrible of an ending as it was for the goose, I felt a little happy that those lions got to be lions for just a few short minutes. And the Hogle Zoo staff handled the situation wonderfully and had zoo workers dispersed in the crowd within minutes to answer questions and to help explain to the children what was happening and to encourage people to walk away if they found the situation too disturbing. Weekly Workouts: Monday - CrossFit! Back squats: 30 reps at 70% of 1RM with a 200m run penalty for each re-rack (3 runs. 75lbs... hip flexor issues). WOD: 4-min AMRAP - 10 walking front rack lunges (65lbs) + dips (blue band). 1-min rest. 4-min AMRAP - 10 wall balls (14lbs) + 10 power cleans (65lbs). 1-min rest. 3-min AMRAP - Bar-facing burpees (total reps 155). Tuesday - Bench press (1RM 103lbs). WOD: With a partner - 1000-meter row + 50 ab mat sit-ups with 20lbs ball + 20 deadlifts (155lbs) + wheel barrel across the floor with 20lbs dumbbells (9:30). Wednesday - Rest day! Thursday - Trail run! Dry Creek to Downtown. 9.3 miles/1:31/958 ft elev gain. Friday - CrossFit! Strict shoulder press, 25 reps at 75% (68lbs). WOD: 4 rounds of - 20 double unders + 15 box jumps (20 inches) + 10 thrusters (65lbs) + 5 front squats (65lbs), 1-min rest between rounds (13:00). I love the zoo, but mostly just because I love animals. It makes me sad to think we keep them caged up for our pleasure. My brother jokingly (not joking) calls the zoo, "animal prison". It seems like Hogle Zoo is doing what they can to make the animal enclosures and exhibits updated and nice. It would have been hilarious if someone started singing "The Circle of Life" from the Lion King during all the commotion. We go to our Denver zoo frequently, and I can assure you we have never seen anything that dramatic. I have to agree with Jenn, that it would have been funny if someone started singing Circle of Life. My son watches Lion King frequently, and I don't think he quite understands what happens to Simba's father in that movie. One day.